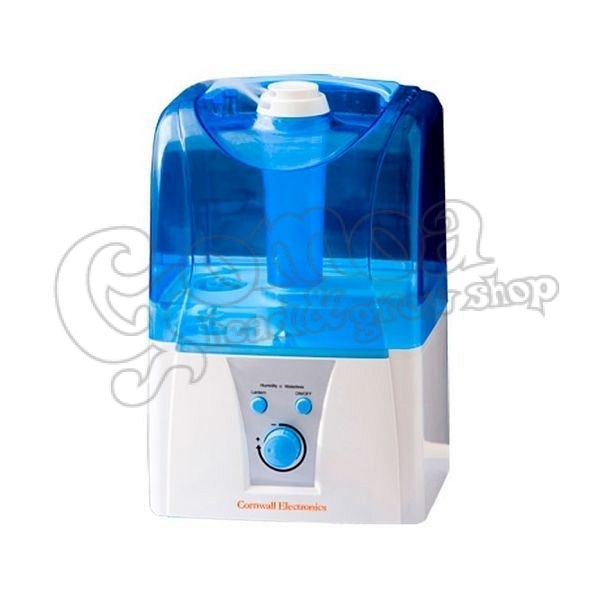 Ultrasonic humidifiers use a piezo-electric transducer to create a high frequency mechanical oscillation in a body of water. The water tries to follow the high frequency oscillation but cannot because of its comparative weight and mass inertia. Thus, a momentary vacuum is created on the negative oscillation, causing the water to cavitate into vapor. The transducer follows this with a positive oscillation that creates high pressure compression waves on the water's surface, releasing tiny vapor molecules of water into the air. This is an extremely fine mist, about one micron in diameter, that is quickly absorbed into the air flow. Since the mist is created by oscillation, not heat, the water temperature need not be raised. Ultrasonic humidifiers, therefore, can create instantaneous humidity, and don't have to wait for a heating element to boil the water. This precise on/off humidity control is the hallmark of ultrasonic humidifiers. In addition, unlike wet pad humidifiers, ultrasonic units can be of comparatively small size, and still produce significant amounts of vapor. The biggest advantage of ultrasonics is the energy savings. Compared to steam canisters and infrared humidifiers, ultrasonic humidifiers require about 93% less electricity to humidify the same size space! In addition, this small electricity requirement can lead to significant savings in the cost of wiring, electrical distribution boards, standby generation and even the main input transformer to the building. Energy analysis calculations show that the lower energy costs, alone, can give the customer a payback in a single year. Another advantage to ultrasonic humidifiers is their easy maintenance. There are no pans to scrub, infrared bulbs to change or steam canisters to replace. They are easy to clean, especially if the customer uses purified water, which has the added benefit of eliminating contaminates from the discharged air.